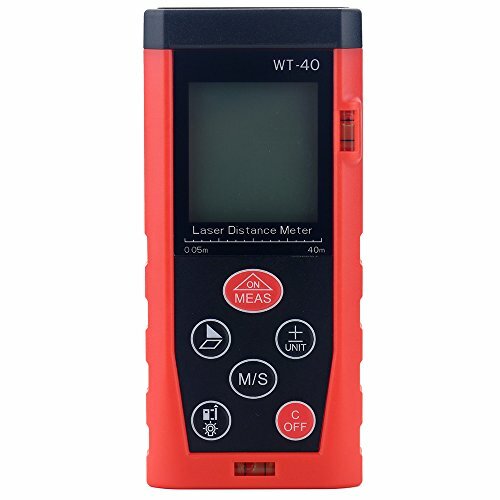 UltimaFio(TM) 40m/131ft Digital Laser Distance Meter Diastimeter Range Finder laser Rangefinder M/In/Ft Memory func Area Volume Level Bubble [40m] by UltimaFio at EISF. MPN: Ul-32796570797-SLF-Rangefinder-40m. Hurry! Limited time offer. Offer valid only while supplies last. Features: High accuracy and wide measuring range. Quick measurement of distance, area and volume. Automatic calculation of area and volume. High accuracy and wide measuring range. Quick measurement of distance, area and volume. Indirect measurement by the Pythagorean theorem. Switchable units among meter (m), inch (in), feet (ft). 20 data records and recall function. Auto power off when no operation in 3 minute. Auto backlight off when no operation in 1 minute. Auto laser switch off when no operation in 1 minute. Minimum distance tracking (display value) under continuous measurement. Single measurement & consecutive measurement. View More In Laser Rangefinders. If you have any questions about this product by UltimaFio, contact us by completing and submitting the form below. If you are looking for a specif part number, please include it with your message.